I’m a fan of Champagne, and my husband doesn’t mind it either. We’ve been on wine-tasting trips before, so he approved of my decision then left me to get planning. After researching I settled on staying at a small hotel in Epernay near the Avenue de Champagne, but to be truthful, I just found a hotel close to Moet & Chandon that was within walking distance. Actually, I’m pretty sure I decided to visit Moet before I decided on Epernay. I booked a tour and tasting with Moet & Chandon via the internet months in advance, and planned my trip around this particular appointment. Since we were only set to spend 2 days in the region, planning ahead for tastings and tours was more important than I realized at the time. 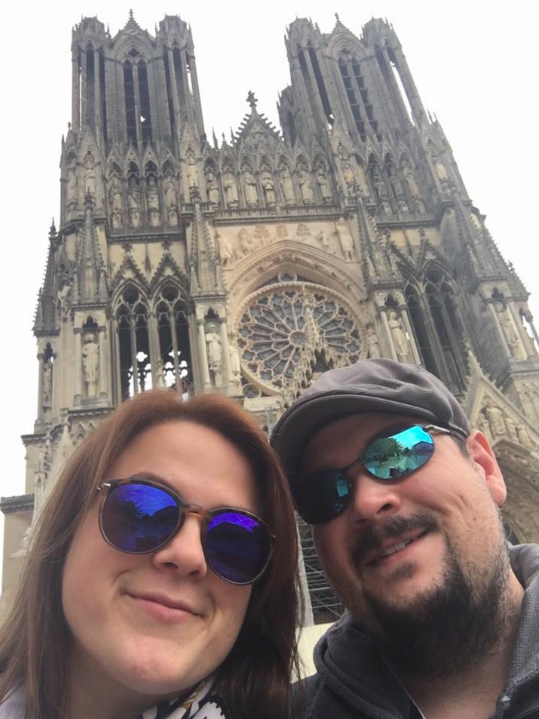 Our German family is located in southern Germany near the French border, but still 4 hours from Epernay. We rented a car for our entire trip to Europe (not just France), and drove off early in the morning to head for France. After some pit stops, some misdirection trying to find our hotel in the city of Epernay and dealing with parking, it was already 2:00pm by the time we were ready to hit the streets. This was a problem – as we soon found out: Businesses in the city close from 2:00-4:00 during the week (maybe even the weekend? I’m not sure). We were starving and everything was closed. I was hangry and frustrated by the time we finally found a bakery called Paul that was open and serving sandwiches. Thank God for Paul! (I was so grateful for Paul that I insisted on having breakfast there the next morning). After eating, we made our way over to the Moet & Chandon Champagne House for our appointment. 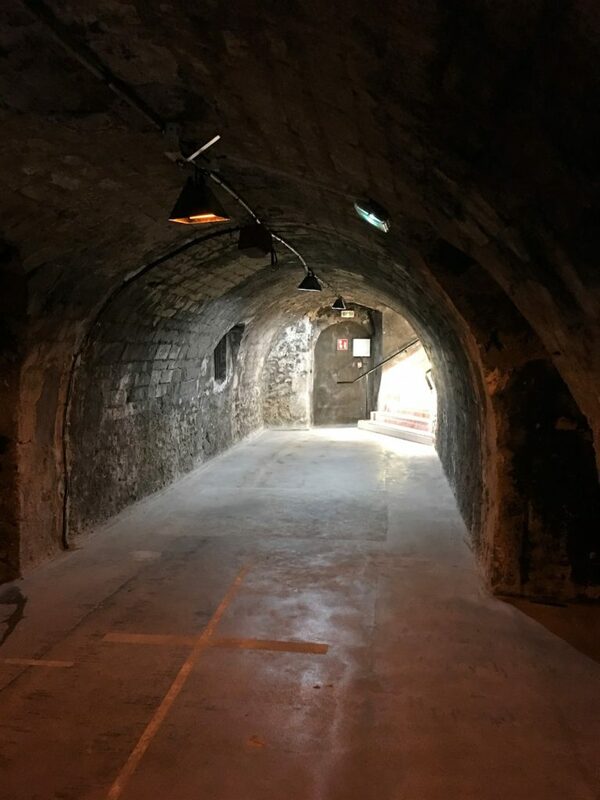 We enjoyed a 45 minute tour of the cellars that run underneath the Avenue de Champagne, along with a tasting afterwards. For most tastings, the house will offer an upgrade to taste a more expensive sample, and since my husband thinks he’s bougie when it comes to wine, he upgraded us. But it was worth it! We both found that the more expensive samples were better. After hitting the Moet store and contemplating going home with a bottle, we decided against it, since we could come back if we wanted to. When leaving Moet at 5:00, we found out that nearly all of the other Champagne houses close around 5:00 for tastings. What a bummer!! We walked the Avenue and found one that was open until 5:30 and headed in. We tasted some samples at A. Bergere and bought a bottle of Rose to take with us. So many bottles of Moet Champagne! We walked around Epernay on the way to the hotel, scoping out possible dinner spots, and found one to return to. The food was so good! We had Escargot, pasta dishes, and dessert plus Champagne of course. This was one of the best meals I had in all of Europe. The next morning we packed up and headed for Reims – the other major Champagne city. Driving through the French countryside was great. We were treated to the fall colors on the rolling hills throughout the vineyards on the way to Reims. Then we had a rude awakening when we hit the city: Reims is much larger than Epernay, and traffic can be an issue. After a frustrating trip around the city, we found ourselves hungry again and it was nearly 2:00 – so everything was closing! Luckily I found a pommes frites cart and ate french fries for lunch (with mayo- you gotta get them with mayo!) in front of the Notre Dame de Reims. The Notre Dame is definitely a spot to hit in Reims (along with the Champagne houses). Although this is not the Notre Dame in Paris – it is a replica and looks exactly the same. The Gothic church is usually open to tour, and it’s a great spot to take photos. Next we set off to hit more Champagne houses, and had another setback… we got stuck in an area of the city near the Champagne houses with one-way streets, and very little parking. We almost gave up after stopping at a Children’s park to recoup and try to look up info on the interwebs about parking in the area (P.S. France has terrible internet EVERYWHERE). Eventually, we made it to Vueve Cliquot and got a parking spot, but upon inquiring at the front desk, all of the tours were sold out for the day. So we headed to the gift shop to taste some champagne. We were again presented with an upgraded tasting, and chose this, which was a winner. We left with an awesome, pricey bottle of La Grande Dame by Vueve Cliquot. We just recently shared the bottle with some friends and it was worth every penny! Lisa is a Metro Detroit blogger, freelancer, and fitness instructor, who created The Wedding Cat Blog after DIYing her recent wedding. Growing tired of looking at models in wedding dresses, styled ‘wedding’ photoshoots, or celebrity dream weddings, Lisa set out to create a community that features real brides and real weddings, along with the planning that goes along with them. When she’s not doing Yoga or Jazzercise, she’s likely watching Bravo! or looking at funny cat pictures on the internet. I LOVE Champagne, France! It’s definitely a charming, special place to spend a day or two 🙂 Yes to all of this article! Oh my word, look at those cellars. Definitely worth visiting for the tours alone, aren’t they? Yes! 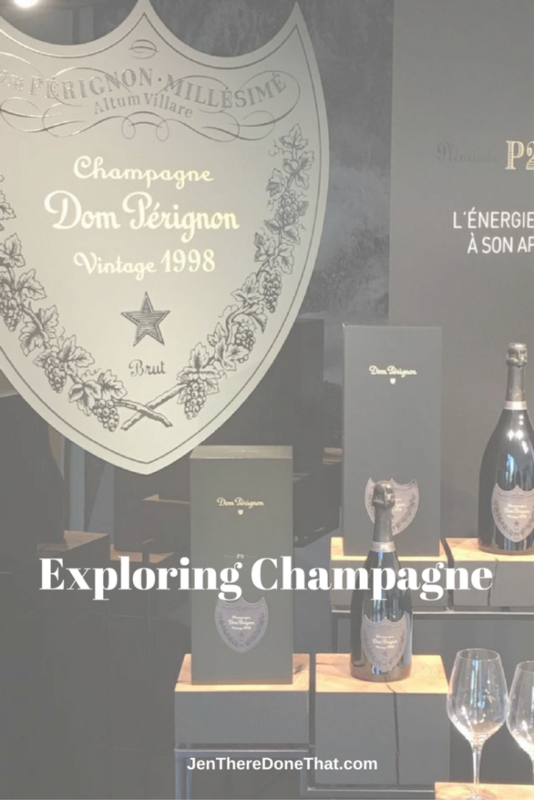 The history of the region, the limestone cellars, and delicious beverages are all reasons to come to Champagne region to visit. Awwe! Champagne tasting in one of the best countries to do so! I haven’t tried this yet because we don’t have it here in the Philippines–not that I know of. Haha! Thanks for virtually bringing me with the tour with you. 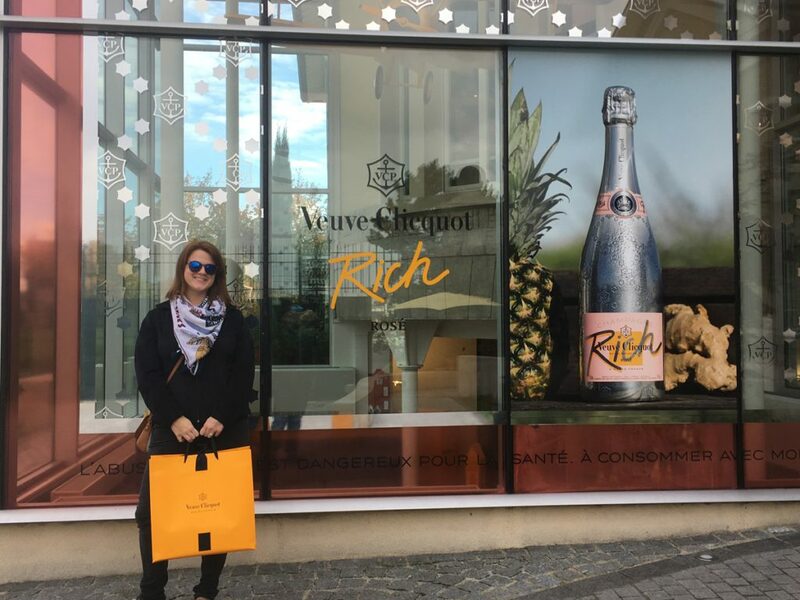 I drink Veuve Cliquot all the time and would love to go to the original store! I’ve also never toured a wine cellar before and would love that experience. Great post – hope I make it around France outside of Paris one day. Guest writer Lisa missed the Veuve Cliquot cellar tour, but it was my favorite! Reims and the entire Champagne region are absolutely worth a visit. There’s literally never a bad time for champagne! I toured the Korbel vineyard in Sonoma, where they make California Champagne, and I was so impressed with the process. I think touring the Champagne region of France would be so delightful! 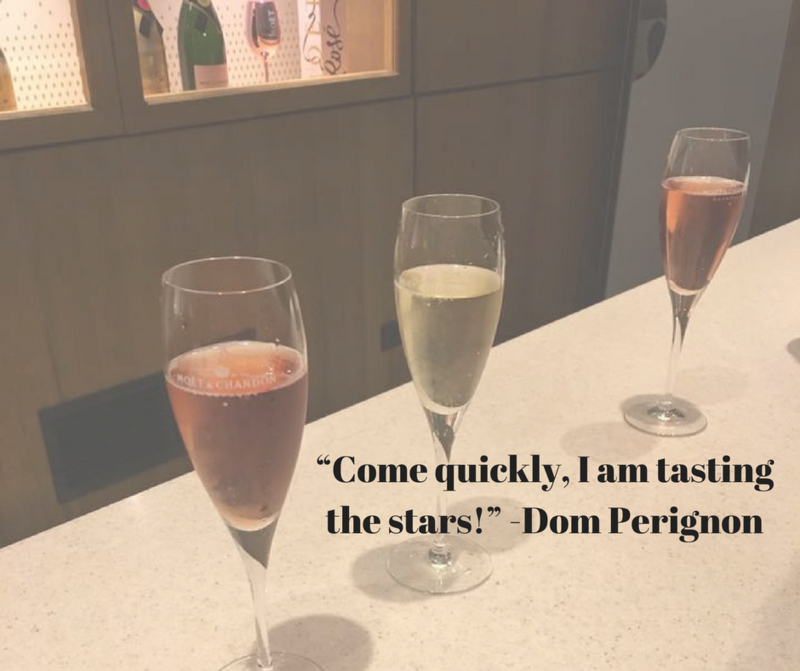 Oh my – I love Champagne and would love to visit the region and do all the tastings and cellar tours. This is one of my top 10 foodie experiences to have – and I’m hoping to fulfill it next time I’m in Europe. This sounds like my wife’s kinda tour. So many champagnes to sample. My wife keeps bugging me to take her on a tour like this. Maybe next year. I have bookmarked it for my wife read when she comes home. Nice post! Thank you! 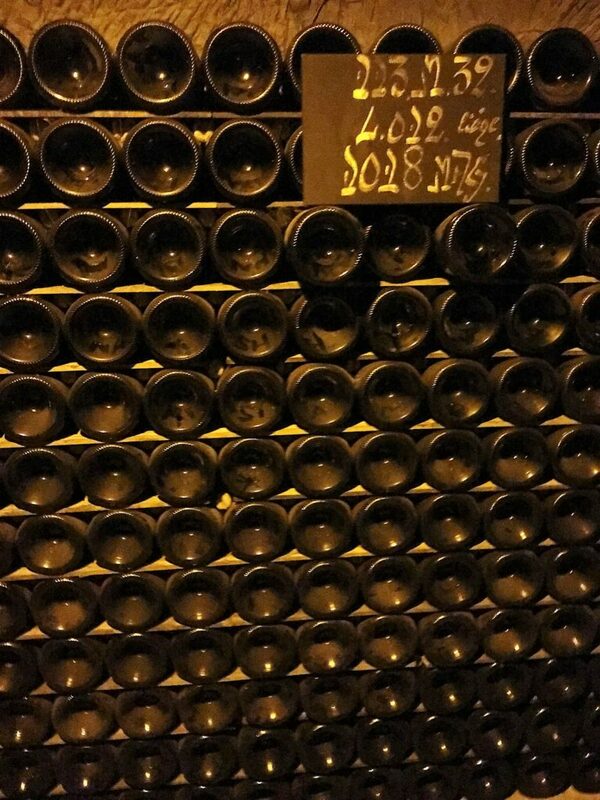 Even if you do not drink Champagne, the tours are filled with history and interesting information. That is awesome! Be sure to book your cellar tour in advance, they fill up quickly. I was just in Paris but since I’m not much of a champagne person, I didn’t really drink any. But it’s cool to see so many houses that you can try out. That collection of Moet Champagne is pretty amazing! I found it much easier to take the train into Reims, then walk or taxi rides to the houses. I’ve done wine tasting before but champagne tasting takes it to a whole new level! I never even knew you could do this. I don’t think I’ve ever seen so many bottles of champagne stacked up. What a wonderful idea for a trip! Champagne is my fav drink too. I could drink a a glass everyday if I could!! And ofcourse I really wanted to explore Champagne when I was France, but unfortunately I couldn’t! So thanks for this virtual tour! I went here years ago not for a week but for the day out of Paris. I wished I had spent longer out there though as I really enjoyed it. Your post has definitely made me want to go back and spend more time. I hope that you had a wonderful time. What a great tour, trying so many varieties of champagnes. I have never seen so many bottles of Moet champagne. It’s a shame the Vueve Cliquot tours were sold out but you still got to try champagne in the gift shops which ain’t bad! The guest write, Lisa did not make it to VC. Went I went years earlier, I stayed for an entire week and toured Verve Cliquot.